With each monthly payment, they are gradually paying off their mortgage loan, owning a larger percentage of their house, and accumulating net worth. For this example, we’re going to identify how Drevis and Josie have built over $115,098 in Equity over 4 years. Drevis and Josie purchased their home for $299,000. In order to buy the home, they had to pay a down payment; which is an initial payment made when something is bought on credit. A bank or other financial institution then covers the remainder of the costs through a mortgage loan. Unfortunately, not all of that has gone towards the principal of the loan, most of it has gone towards paying off the interest of the loan, which doesn’t build equity. BUT every month, a portion of their mortgage has gone towards the principal amount of the loan, through which they have been building equity! We know this is confusing, luckily there are many resources available to guide you through the home buying process! + Equity can be defined as: the value of a mortgaged property after deduction of charges against it. Which means, the current value of the property minus the amount still owed on the property. 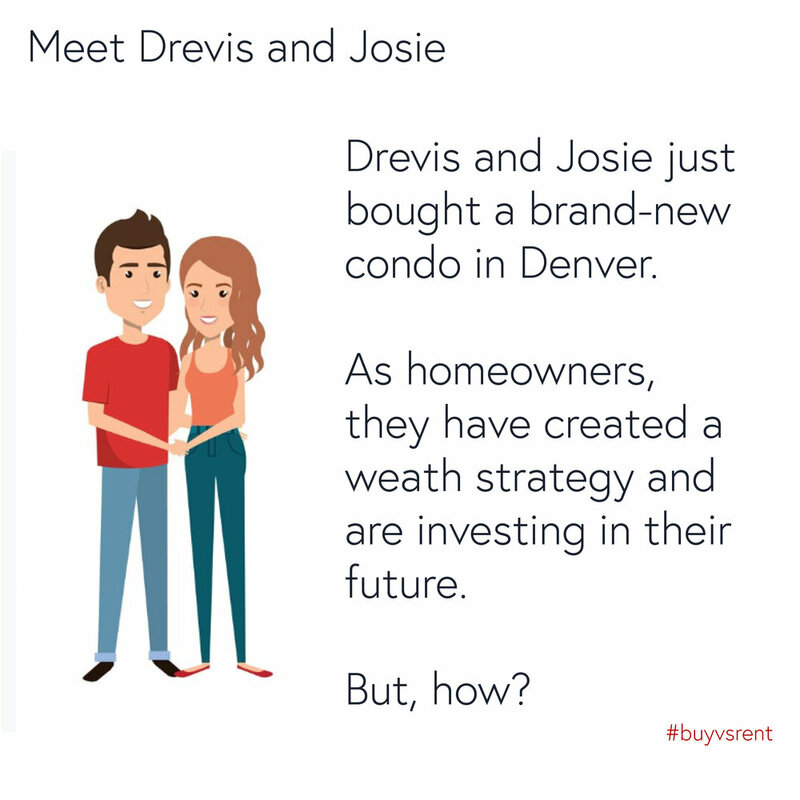 Now let’s compare Drevis and Josie to Andrew, who just signed a lease for a 1 bedroom apartment in Denver. 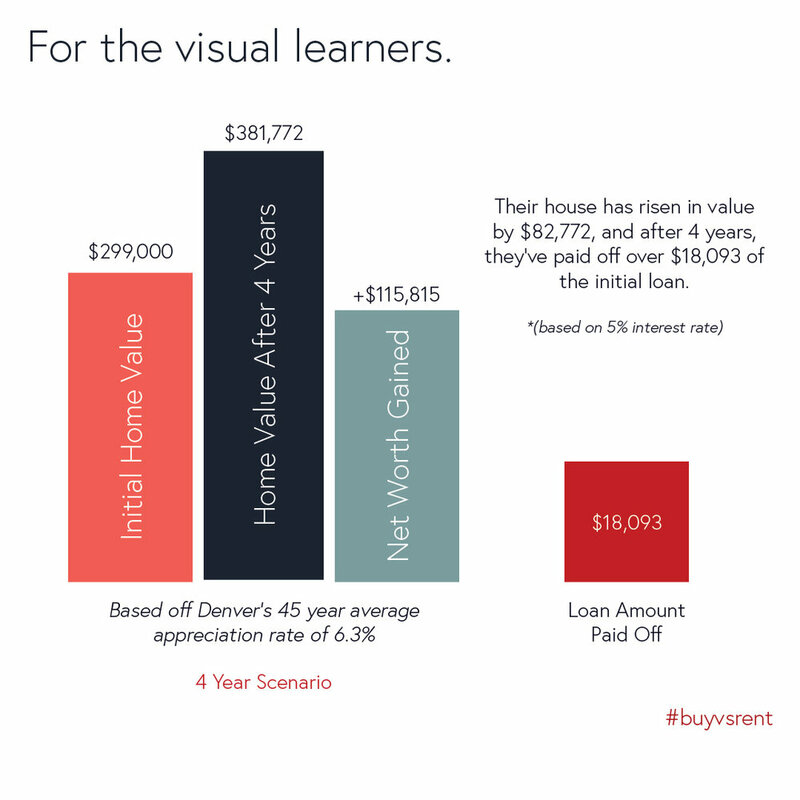 $1,850 is the average rental rate for a 1 bedroom apartment in the Denver University neighborhood. His $1,850 rent check goes straight into his landlord’s pocket – he’s essentially throwing it away. If Andrew lives at his current address for 4 years (48 months), he’ll have spent a total of $88,800 on rent. At first glance it seems that Andrew is saving money compared to Drevis and Josie. But, there’s more to it that total expenses. We’ll show you why Drevis and Josie are much smarter than Andrew. Andrew’s $88,800 rent check is $88,800 Andrew will never see again, and it doesn’t go towards anything. As a renter, Andrew is building zero equity and not accumulating any net worth. It is smart and financially responsible to buy instead of rent if you can. Drevis and Josie have gained $115,815 in equity. As home-owners, Drevis and Josie have gained $115,815 in net worth. Their monthly payments are nearly the same. For a similar amount of money, Andrew could be creating a wealth strategy and investing in his future, but he’s not.